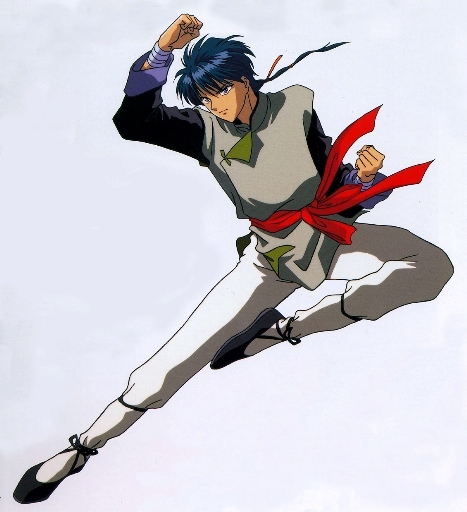 The seven Seishi are the protectors of the Suzaku no Miko, Miaka. They all have birthmarks showing the kanji of which constellation they represent, and would give their lives to protect Miaka. It is this bond of absolute dedication and loyalty that keeps Miaka going and ensures their mutual trust, respect, friendship and love. 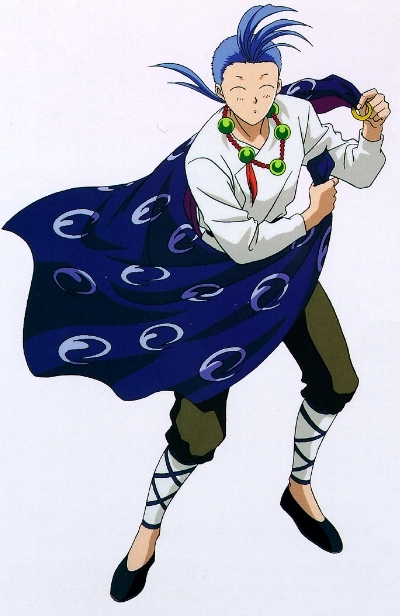 The first of the Seishi is Tamahome (aka Sou Kishuku), who Miaka and Yui meet when they first enter the Universe of the Four Gods. 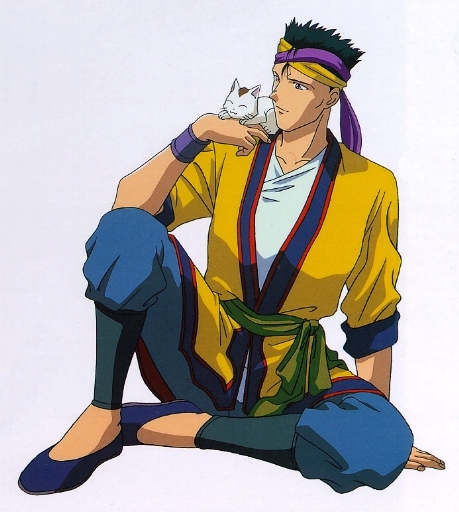 He at first appears to only have one thing on his mind: money, but later revelations show him to be kind, compassionate and loyal, and Miaka quickly falls in love with him. Tamahome bears the kanji "oni" meaning "demon" or "ogre" on his forehead and is a highly skilled martial artist. Nuriko (aka Chou Ryuuen) is a Princess of the Realm (no spoilers here! ^_~) who is in love with Hotohori. However, she uses different tactics to get at Hotohori, and poor Miaka doesn't get off to a good start with her. Nuriko posesses super-human strength, and bears the kanji "yanagi" meaning "willow" on the left side of her chest. Tatsuki (aka Kou Shun'u) bears the kanji "yoku" meaning "wing" on his right forearm, describing well his speed and dexterity with his iron flame fan, or Tessan. He is the leader of a group of bandits and originally used the alias Gen-chan. Chiriko (aka Ou Doukun) bears the kanji "cho" meaning "stretched" on his left foot, and is the smallest Seishi, making up for his size with his superior intelligence. Mitsukake (aka Myojuan) is a shamanic doctor wise in the lore of healing; this is his Seishi power, although he is in mourning for his dead fianc� who he failed to save. His kanji means "sadness" and is found on his left palm.